The end of July brought one of the events that I usually look forward to all year long. As usual, after all of the anticipation it is over way too soon. Yet, sketching along some of my favorite artists, being surrounded by all of this creative energy, exploring a new urban place is something that I am so grateful for in my life. This time the location of this symposium was in Chicago . I have never been to the Windy city, and was very impressed with its architecture, rich culture, and diversity. I brought my folding bike which allowed me to travel longer distances and explore some of the precious spots along the Lake Michigan which has surprisingly turquoise water. Chicago skyline from Lake Michigan. Drew this for the Silent Auction to benefit the Urban Sketchers but at the end decided it wasn't good enough. Simo C. also wasn't happy with her sketch, so we just swapped instead. I also managed to miss some of the most obvious landmarks. For example, seems like every sketcher was determined to draw their version of the famous Bean. There are literally hundreds of those sketches floating in the cybersphere–in all different styles. I somehow managed to miss it completely. Looking at my sketches from Chicago I realize that the density and the height of most of the buildings I saw sort of dictated the vertical layout, something I almost never use. Here are a couple of sketches from the 36th floor of the Presidential tower where I was staying. It was fun waking up with sunrise, even if it wasn't intentional–I was still fighting jet lag after coming here from Europe–and then watch the streets gradually fill with pedestrians and cars, peaking around lunch hour. Everyone rushing along carrying their Starbucks cups. 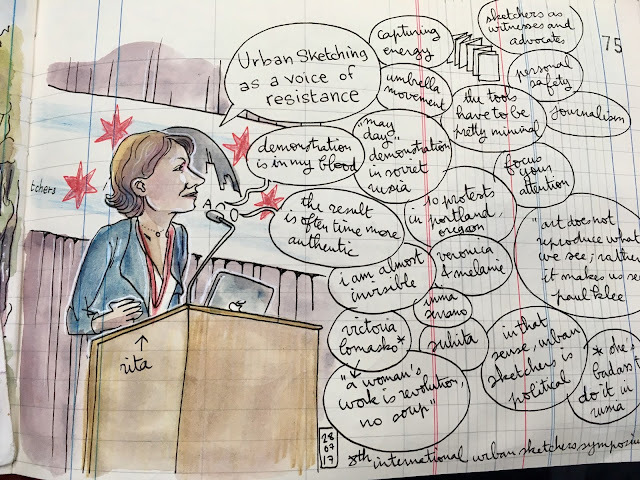 The main reason for me to be in Chicago was to present a lecture on Documenting Resistance Movement in Sketches–the work I have been doing for the last 9 months since the election that shows various protests, rallies, and demonstrations taking place in Portland. The lecture was really well received even as it was scheduled for 6pm on Friday evening. Certainly the most pleasant aspect of Urban Sketching symposium is being in the company of fantastic people from all over the world and all of the socializing that goes along with it.